On Monday he wrote about India and China’s agreement to work together to monitor Himalayan glacial melt. The potential decline in water availability from seasonal snow and glacier melt is finally seeping into the consciousness of policymakers outside the climate world, including the diplomatic and security communities. Lamont frames the step as a rare instance of cooperation in a strategically sensitive area at the center of a 1962 territorial war between the countries. While it would be easy to make too much of such an agreement, it is a tangible recognition of the importance of the ecological unit rather than the national one. It highlights how environmental interdependence across national boundaries can force cooperation in the face of politically difficult relations. On Wednesday Lamont used cheetah diplomacy between India and Iran as an entry point for his story on international attempts to address Iran’s nuclear proliferation threat. India is asking Iran to help reintroduce cheetahs on the subcontinent, where they are now extinct. In what Lamont said would be an “unusual” example of “high-profile cooperation” for the two countries, diplomats are arranging for talks ahead of a regional wildlife conference. This baby step in relations could be even more significant since the United States publicly acknowledged that India may be able to play an interlocutor role with Iran on the hot button nuclear program question. While both of these developments are relatively small in the scheme of the larger strategic relationships, they are fundamentally aimed at (re)building relationships between countries by establishing patterns of cooperation where interdependence is obvious and necessary. Such efforts are just one tool in the often-neglected toolbox of environmental peacebuilding. 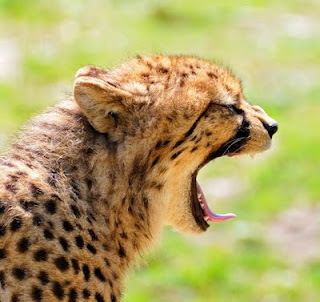 Photo: Yawning cheetah cub courtesy Flickr user Tambako. The Iranian Cheetah population may also be found in Afghanistan, with a few individuals in Herat Province. There have been proposals to develop a transboundary park between Iran and Afghanistan to help with its protection as there are only 70-100 Iranian cheetah's left in the world (too few to start the indian population). The Iranian (Asian) Cheetah is also a different subspecies than the African cheetah, so the Iranian and Indian populations shouldn't hybridize. The idea behind the park and Cheetah Diplomacy was that if two countries (here Afghanistan and Iran) could talk about Cheetahs, they may be able to talk about other things. This was the idea behind the transboundary Peace Park proposed between Afghanistan, Pakistan, Tajikistan, and China. The question is whether India is the right broker for the nuclear issue, given that the Bush administration weakened the NPT through its deal with India. The clearly bigger issue between Iran and Afghanistan however is water, which will substantially continue to build tensions between the two countries.